The power plant T-150K, T-157, T-158 are SMD engines. SMD-62 engine is put solely on wheeled tractor T-150K, SMD-68 on trelerovochny tractor T-157, RMA-68D T-158. Diesel four-cycle, six-cylinder, V-shaped, with a cooling liquid, as well as direct injection fuel open type combustion chamber, which in turn is located in the piston, and for turbo-62A SMD, SMD-63A - intercooling the charge-air. 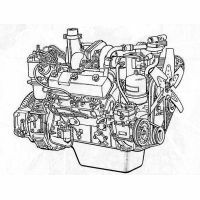 The composition of the diesel engine includes the crankcase, the two cylinder head, crank mechanism assembly units and units of fuel supply systems, assemblies of systems supply air, lubrication and cooling, and exhaust output and starter. Start diesel SMD-62A, SMD-62 occurs directly by means of the starting motor p-350 along with gear 350.12.010.00 with remote control directly to the driver. Start diesel SMD-63, RMA-63A in turn by the electric constant th current PT-142G.